Adds woodcutting and farming in a similar style to TES V: Skyrim to Morrowind. The wood-cutting sound effects were obtained from http://www.freesfx.co.uk. 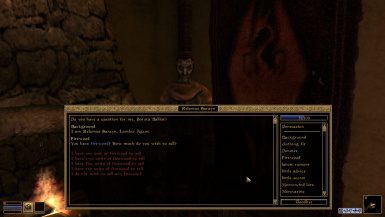 This mod adds simple tasks the player can perform, similar to the tasks present in The Elder Scrolls V: Skyrim. Currently implemented features are Wood-Cutting and Farming. 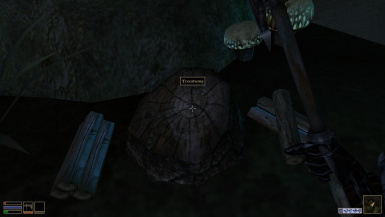 This mod adds several treestumps across Vvardenfel, Mournhold and Solstheim. When activated, if the player has 30 Strength or more, and a woodcutter's axe (added to a handful of locations), they will be able to gather two pieces of firewood. The firewood can be sold to "Lumber Agents", new NPCs scattered across the land, who will, via dialogue, purchase the wood for 5 gold each. Firewood can be sold in groups of 1,2,5,10 and 50. 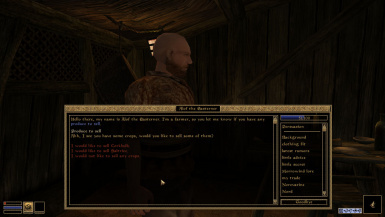 Asking random NPCs about firewood will get them to point you in the direction of the nearest Lumber Agent. NOTE: That there is a small delay between uses of the treestump of 2 seconds. This is unlikely to be noticeable. Any NPC of the class "Farmer" will now buy crops from you through the topic "Produce to sell". They will give you better prices than most merchants will give you, especially early on. Again, ingredients can be sold in groups of 1,2,5,10 and 50. 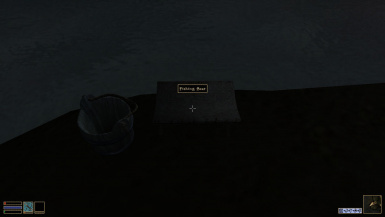 In most coastal towns (with the exceptions of most Telvanni towers), a "Fishing Seat" may be found, from which you can spend one hour attempting to fish for slaughterfish, so long as you have the vanilla "fishing pole" item. 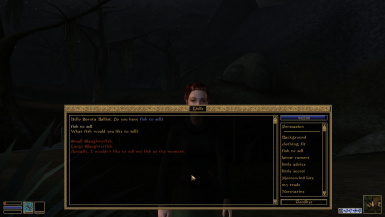 You have a better chance of catching a small slaughterfish than a large one, and it is possible to fail. Nine "travelling" Fishmongers will buy your caught fish off you via the topic "fish to sell". Small slaugherfish are worth 10 gold, large slaughterfish 15. NOTE: Please give feedback on this feature - locations, prices and balance in particular. More features may be added in future versions. Please give feedback and support! There are unlikely to be any conflicts, but if there are it will most likely be clipping errors where another mod has placed something in the same place I have put something (e.g. a treestump). I do not own Morrowind or TES. I also do not own the sound files included, which were taken from http://www.freesfx.co.uk. Please give feedback! This is, after all, my first mod.